Through my Triumph of love and light we will strive to make companion animals family members! 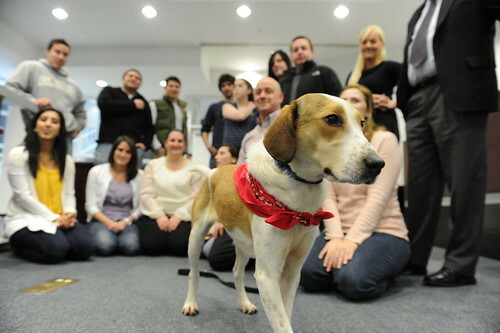 Daniel the Miracle Dog is not from New Jersey. He suffered a near-death experience in an animal shelter in Alabama, where he was placed in a gas chamber with 17 other dogs, all unclaimed strays whose tenure at the shelter had exceeded four days and which labeled them eligible for euthanasia. The animal control officer who found Daniel alive in the chamber kindly arranged for him to leave the shelter, and through the intricate network of rescue organizations that save animals from certain death, to find a new life in a safe, loving home. A foster family gave the dog his Biblical name – honoring the prophet who survived the lion’s den. Today Daniel lives with Joe Dwyer and his family in Nutley, New Jersey, thanks to the work of Eleventh Hour Rescue, based in Rockaway. This pose is perfect for a Speak Out campaign: Provide your thoughts on what I am saying. Keeping our homeless dogs alive is our primary mission, but this morning we woke up with a question: How can we also enrich the lives of the dogs already in homes? Please let us know your thoughts. We have a photo session today for an upcoming article done by Nestle Purina PetCare. I told my dad that afterwards I want to watch the game with my family! I am so excited to receive this award. Please join us!